In the Alpine country west of Innsbruck, Austria, one of the most iconic locations, pictures of which symbolize far western Austria to most Austrians, is not a mountain. It is a railroad bridge. After all, there are plenty of mountains. 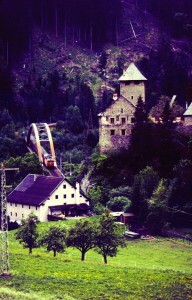 There is only one Trisanna Bridge (Trisannabrücke in German). North side of the Trisanna Bridge in western Austria, with an eastbound freight train, headed by a pair of high-horsepower electric locomotives. Castle Wiesburg is at left in this view that shows the tremendous height (87.4 meters or 284 feet) of the bridge above the valley floor and the Trisanna stream below. The bridge itself is 231.6 meters (752.7 feet) long. I have a larger version of the above image as the desktop background on my laptop computer — and when using that computer in a public location, have actually had quite a few people ask me where that was, whether that was real of a model. Yes. It’s very real. In fact, there has been a railroad bridge at that location for more than a century. This is actually the third version of the bridge at this location. The first bridge looked a lot like today’s bridge, but was much lighter in construction. The stone viaduct approaches to the center metal span are considered part of the bridge and date back to the original construction. By 1923, the original bridge could no longer carry the load of heavier and faster trains and had to be reinforced with a so-called fish-belly construction under the metal span. That was version two. Today’s version was built in 1964 and was one of the most complex engineering projects of the time, as train traffic had to be able to continue during construction. Scaffolding was bult from the valley floor up on both sides of the existing bridge. The new bridge was assembled on one side of the existing bridge. Then, during one night, hydraulic jacks were used to move the existing bridge onto the scaffolding on one side while the new bridge was moved in from the other side. Once traffic resumed on the new bridge, the old bridge was cut up and hauled away in pieces. I had been over the bridge numerous times, several times even in locomotive cabs, but had only seen side views in books and magazines. In the spring of 2000, I decided to remedy that and rented a car in Innsbruck for one day specifically to try to photograph this bridge. 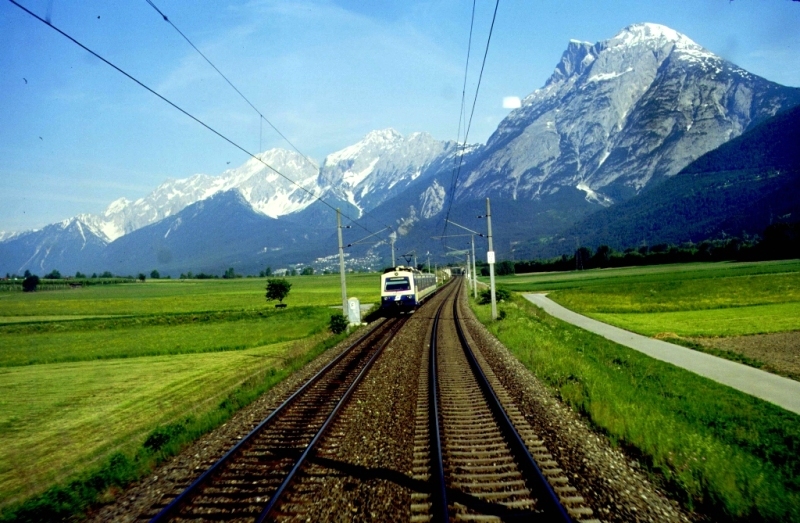 Unlike many other scenic railroad locations in Austria, this one is some distance from nearby stations. 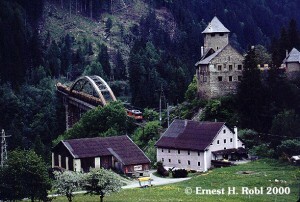 View from a farm road above the Trisanna Bridge with an eastbound long-distance passenger train. The farm has been there as long as the bridge and also shows up in historic photos of the bridge. After photographing the south side early in the morning, I had time to explore other nearby towns as far west as St. Anton. But, my favorite photo, shown at the top of this article, was made on the way back to Innsbruck late in the day with a long lens from quite far away. The weather that day wasn’t great, but it was good enough. If you are in western Austria, this location is well worth visiting. And, there’s no shortage of trains on this single-track section of the Arlberg Line. Trains show up about every 10-15 minutes around the clock. 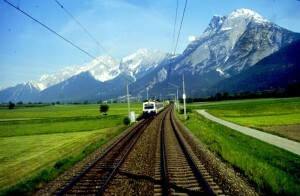 Most trains have two high-horsepower electrics on the point. (Heavy westbound trains that don’t already have a second engine often get a helper in front at Innsbruck.) Some trains also have a third locomotive pushing on the rear. Remember these modern electrics are mostly rated between 8,000 and 10,000 horsepower each! This heavily used main line has grades up to 3.1 per cent and traffic has to keep moving briskly. The additional locomotives that help get trains uphill to the Arlberg Tunnel also help with dynamic braking on the way down the other side. As noted above, you will need a car to be able to explore the area. During my 2000 trip, all the locals I encountered, including employees at smaller stations which no longer had passenger service were invariably friendly and helpful. Another view from above the bridge in the morning. A unit train of logs is crossing the bridge, headed by an 1110.5 electric (available as a Roco model). Be aware that lighting for photography can be tricky because the bridge is in such a steep gorge. And from late fall through early spring, you could encounter snow, which would also make driving difficult and which would almost certainly require either four-wheel drive or chains (or both) on the steep secondary roads. Slightly overcast days may even be helpful as the lighting would be more evenly distributed. 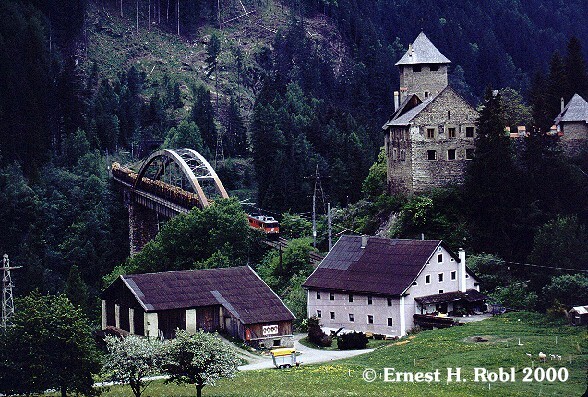 If you are thinking of modeling this scene on your layout, think again by considering this: In HO scale, the entire bridge (including the stone approach viaducts) would be over eight and a half feet long, with the center metal section alone being over four feet. The depth of the gorge below the bridge would be over three feet in HO scale. Even Austrian club layouts that have tried to include this iconic location have used selective compression. But, a more modest version of this type of bridge can be created with products available from several manufacturers. 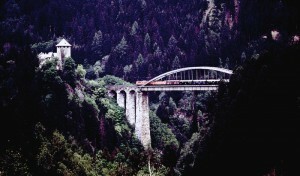 The tall stone viaducts and metal bridge sections are available separately. There’s a scale model of the bridge in the Vienna Technical museum, but I don’t remember what scale it is. I mentioned above that the weather on the day that I photographed the Trisana bridge wasn’t that great. But, a few days later, when an ÖBB official took me around to several railroad facilities and accompanied me on a cab ride up the Arlberg line, it was spectacular. This photo was made shortly after departing Innsbruck. Meeting an inbound 4020 commuter train (available as a Jägerndorfer model) early in the morning on double track on the way up the Arlberg line, shortly after leaving Innsbruck. A larger version of this picture is currently the desktop background on the large monitor of my desktop computer. When I look up the track in that picture, I always remember that the Trisanna Bridge is less than 50 miles ahead. I crossed it two more times that day, both ways on an engine.